We made a decision to no longer support the Windows Phone 7 LiveChat application. If you need a mobile application, check out our iOS and Android apps. 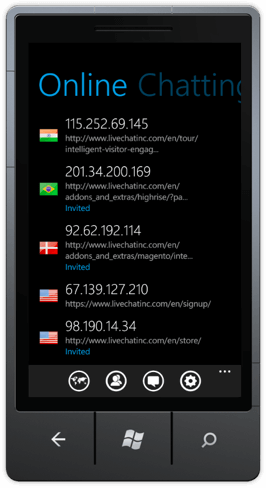 Happy day for all Windows Phone 7 users – the LiveChat app for this platform is ready and all users can now stay online on LiveChat no matter where they go! LiveChat for Windows Phone 7 joins the group of our mobile apps already including iOS (iPhone) and Android platforms. Windows Phone 7 is a quite young platform – Microsoft launched it only half a year ago as a major step ahead in comparison to previous versions of its mobile platforms. Its position on the market got strengthen after Nokia and Microsoft announced a “strategic alliance that makes Windows Phone 7 Nokia’s primary smartphone platform“. This makes competition between Microsoft, RIM (BlackBerry), Apple and Google (Android) in the field of mobile platforms even more interesting. Get free LiveChat for your WP7 mobile by typing ‘LiveChat’ in Windows Phone 7 Marketplace directly on your device or install the app using Zune for Windows Phone 7. Obviously the LiveChat app for WP7 can be used along with apps from other platforms, as we allow accessing LiveChat from multiple devices.